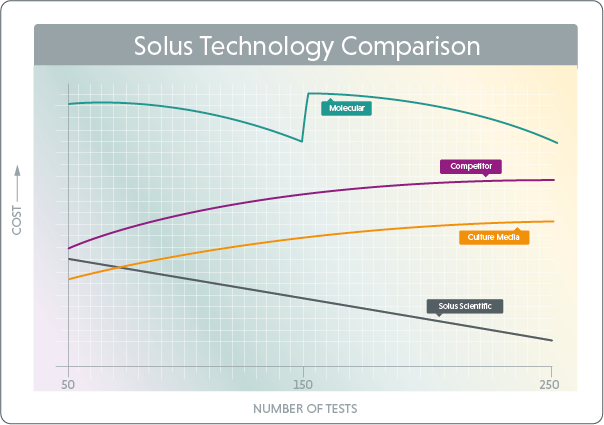 Solus testing systems use proven immunoassay innovations that is simple to deploy and needs no lengthy biomedical identification procedure. The traditional culture method of growing bacteria is slow and labour intensive. It also relies on a level of expertise to identify suspect colonies. Molecular methods are sophisticated alternatives but are expensive to adopt. On top of costly, specialised equipment, it requires specially trained staff and purpose made facilities. Solus testing systems are the most cost effective, least labour intensive methods available. Available as a complete food pathogen screening solution, Solus Scientific provides instrumentation and selective enrichment media for Salmonella and Listeria screening.